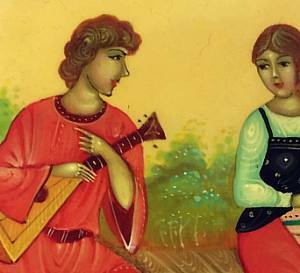 from Mstera-style by K. L.
A young man stops playing his balalaika to court a young maid, who is sitting some distance apart and looks shyly away. The simple attire of the couple, the wooden bench on which they are sitting, and the surrounding greenery of the field all add to the rustic atmosphere of the piece. The painting is done in traditional Mstera style, with color filling the background completely; yet unlike other Mstera pieces, this one accentuates the main subjects with brighter reds and greens that stand out against more subtle background colors. The composition is adorned with a lovely silver ornament punctuated with blue flowers. The same ornament surrounds the sides of the box. 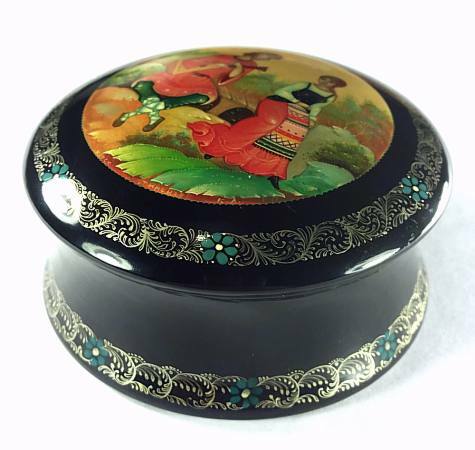 The box is made from papier mache. It sits flat with no legs and opens without a hinge. The interior is red. Signed with the name of the composition, artist's initials, and city. Lacquer is in very good condition.